Business owners, who want to deliver exceptional customer experiences, personalized campaigns and want to connect over a variety of devices may need to combine both private and public clouds with a dedicated or virtual Cloud server. If your Cloud could have unpredictable traffic or expects to be in high demand, you may need to pay as you go in a Public Cloud. 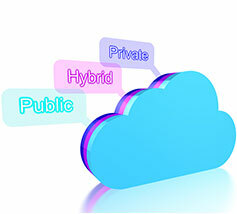 However, for better security and access control, a Private Cloud may be necessary and more affordable. Dedicated Servers provide the fastest performance and reliability. Virtual servers in our private Uptime Cloud could also provide the cost savings and performance your business requires. Maybe your firm just needs Desktops As a Service (DaaS) or a virtual server to host your software (SaaS)? We can guide you through the process of making these decisions and evaluating the many options available. Uptime Technologies can help assess if one or all of the solutions above is best for the smooth operation of your business. Once we work together to determine which method is best, then we manage the Server and Cloud Services for you. Contact Us to learn about this service.